My Kitchen Cafe was one of the very first foodie blogs that I started to follow a couple of years ago. She has a Perfect Potato Salad recipe on her site. I wanted to use my homemade mayonnaise, hard boiled eggs, and canned potatoes, which I thought would be perfect with this recipe. The recipe came together very easily; it calls for buttermilk, which adds a slight tanginess to the salad. After mixing in the mayo and the buttermilk, I noticed it was quite 'soupy.' I blame it on my homemade mayo, which is not as thick as the store bought stuff. Sigh. After seasoning the dressing, it was time to add in the potatoes. I used two quarts of my canned red potatoes by draining and dumping them into the dressing. So, so easy! No cooking, no peeling, no nothing! Canning your own potatoes gives you instant cooked potatoes that are ready to use. The potato salad was stored in the fridge overnight to allow all the flavors to be absorbed into the potatoes. How did they taste? Almost perfect...I need to perfect my mayonnaise and add some more vinegar or lemon juice to it. I think that would help. The potatoes? 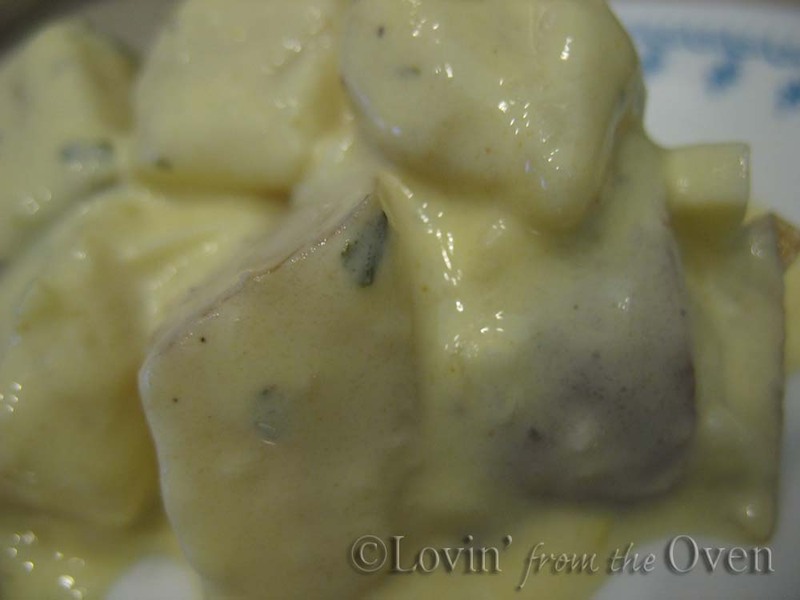 Firm, tender and not mushy ~ perfect for a potato salad! I love hard boiled eggs in my potato salad. I used five eggs, although it calls for ten. My hubby is a mustard fan. He would love it more if it had tons of mustard in it. That's the thing about potato salad...it's versatile and you can put anything you want in it: mustard, vinegar, pickles, celery, the works! Hubby just squirts in some of his favorite spicy brown mustard on his potato salad and he's happy. What is your idea of a "perfect" potato salad? I am definitely a fan of homemade potato salad with mustard & mayo sauce, chopped pickles and celery, and hard boiled eggs. Raw onions and I don't get along well so I prefer no green or white/yellow/red onion in the mix. Prepared and deli potato salads all use some ingredient which I do not like. Not exactly sure what it is, but it's distinctive and ruins it for me every time. Firm potato dices are important. I've had warm, german potato salad. It's okay, but not my preference. I make the sauce with mayo, brown sugar, ketchup, mustard, salt & pepper. I add a little onion, potatoes, crispy bacon, lots of boiled egg, and celery. Yum! I love Potato Salad but my husband and 17 year old son do not. Needless to say I have been on the quest for one they will enjoy. This was a huge hit and they both asked that I make it again soon!